FULTON, NY – The fight against breast cancer in Oswego County is something that members of Cold Springs Golf Course in Mannsville take very seriously. Over the past five years the league has raised several thousand dollars in support of breast cancer awareness organizations. 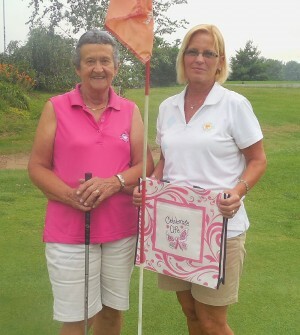 Ladies at Cold Springs Golf Course in Mannsville will host the annual Rally for the Cure golf tournament in support of OCO’s Cancer Services Program Partnership on August 23. Pictured are tournament planning committee members Arlene Bauer (left) and Mary Alfrod. Absent are committee members Lisa Bauer, Lisa Clark and Sheila Clark. The past 3 years, the members have decided to donate proceeds to Oswego County Opportunities’ Cancer Services Program. OCO’s Cancer Services Program provides free breast, cervical and colon cancer screenings and diagnostic services to uninsured men and women aged 40-64 in Oswego County. As a result of these free cancer screenings, many men and women have received life-saving screenings and treatment. Cold Spring Golf Course continues that support this year as they host the fifth annual “Rally for the Cure” Golf Tournament. Scheduled for Aug. 23, the four-person, captain and crew format tournament will be held at the Cold Springs Golf Course, 1941 Route 11 in Mannsville. Registration begins at 8 a.m. with tee off at 9 a.m. The tournament will be the same as last year, 18 holes of golf, best ball, captain and crew. Mulligans, skins, and new this year will be some special putting fun games. A grill, courtesy of Vella’s Supermarket, and a 50/50 raffle will be held. Participation in the tournament is $45 per person and includes 18 holes of golf, pull cart, hot dogs and a chicken BBQ. For more information on the tournament, and opportunities for hole sponsorships and team sponsorships, call Bauer at 315-465-6515. Administered through Oswego County Opportunities, the Cancer Services Program Partnership offers a number of cancer screening services including: Clinical Breast Exams, Mammograms, Pap/Pelvic Exams, and Colorectal Cancer Screenings for men and women. These screenings are available year round, free of charge, and play an important part in maintaining good health. For more information, or for eligibility requirements, on the Cancer Services Program Partnership contact Handville at 315-592-0830.